Nice work, UK, letting in anti-semites and blocking Israeli politicians and atheist critics of Islam from entering the country. God forbid the latter offend anyone. 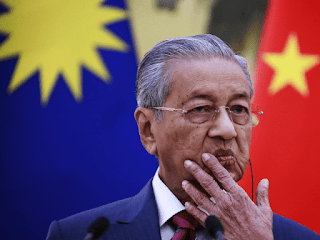 “There are many races in this world, I have said nasty things about them but they never accused me of being anti-this or anti-that,” Mahathir Mohamad said on the program Hardtalk. “If you are going to be truthful, the problem in the Middle East began with the creation of the State of Israel, that is the whole truth,” the Malaysian prime minister said. During his address to the UN General Assembly last week in New York, Mahathir said the world “rewards Israel” for committing acts of terror against Palestinians. On his visit to the UK, Mohamad was welcomed by the heads of prestigious academic institutions Imperial College and Oxford University. In the past Mohamad has boasted that he is “glad to be labelled anti-Semitic.” He has drawn comparisons between the Jews and the Nazis. “Today the Jews rule this world by proxy. They get others to fight and die for them,” he said in 2013.